Used for forge welding flux, brazing flux and a constituent of arc welding flux. Also sold world wide under the trade name Solubor® as a boron fertilizer. So, to get borax that doesn't make that weird dance on the steel. Just pop it in the oven at 150°C for an hour or so and the water will go away. This will make the borax slightly faster in protecting the steel from oxygen and other harm. THANKS I had a lot of trouble finding that piece of data (went trough the entire library on chemistry). Borax is used for brazing and forge welding flux. It is applied several ways. Brazing rods are coated with it or plain. When using plain rods the end is heated and then dipped in some borax powder which sticks to the rod and begins to melt. When forge welding it is common to sprinkle it on. Occasionally a hot piece of iron or steel is "dipped" in the can or box. Many smiths go to the trouble to forge a long handled spoon. Another method is to use a "poker" with a short bent end. The end is heated then dipped in the flux. The flux is then transferred to the part while it is still in the fire. This has the advantage of not removing the part from the fire OR sprinkling a lot of flux in the forge. The high temperature solvent effect of borax will also dissolve refractories (such as your forge lining or fire brick), which after all, are metal oxides. Add one box of Borax to a 9" x 14" casserole dish. Bake at 500°F (260°C)for 2-1/2 hours. Let cool where your wife won't see it. In 1988 the Dial (soap) Corporation bought the exclusive rights to make and sell such home pantry staples as 20-Mule-Team Borax all-purpose cleaner, Borateem stain remover and Boraxo powdered hand soap. At the time the U.S. president is Ronald Reagan, fondly remembered as the host of "Death Valley Days" once sponsored on TV by Borax. "In 1880 a vast deposit of borax, nature's magic water softener and cleanser, is discovered in Death Valley, Calif. Soon teams of 20 mules are pulling 12-ton wagons across 165 miles of hot desert to the railroad. 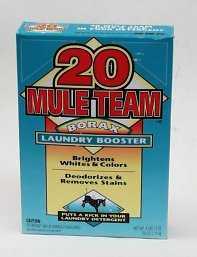 Today we market it as 20-Mule Team® Borax." NOTE: Boraxo hand cleaner, is NOT the same as BORAX and does not work as flux. Welding flux may also have other substances added to it. Boron compounds such as boric acid are common additions. Flourite (flourspar) is also used for materials dificult to flux such as stainless steels. Flux grade flourite is 98% CaF2. Bladesmiths add 5 to 10% flourite to borax for forge welding stainless, nickle and chrome alloys.